Joyce is learning how to needlepoint and has worked some of her design in tent stitch. She asked me how she could make the cat in her current project look furry. I suggested velvet stitch and this page is a quick needlepoint stitch guide to the technique. 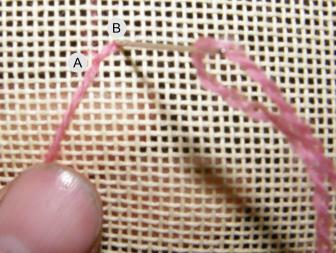 For more needlepoint stitches check out the Stitch Index. The sample below was worked on 18 count needlepoint canvas using Appleton's crewel wools and is worked over two canvas threads. 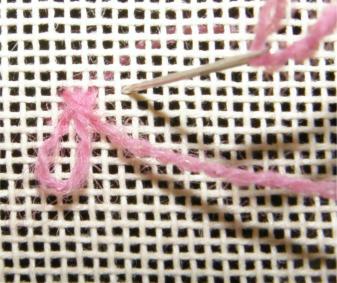 Begin with the bottom row of your velvet stitch section and work towards the top. Start by working a half cross stitch from A to B. Then bring the needle back up in the first hole again. 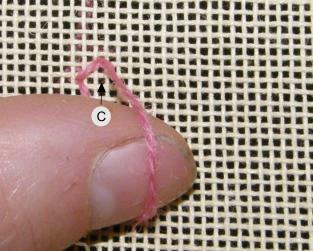 Holding the yarn under your thumb take the needle back through the canvas at B, but don't pull the yarn right through. Leave a loop on the surface and bring the needle back up at C. Do not put your needle through the loop! 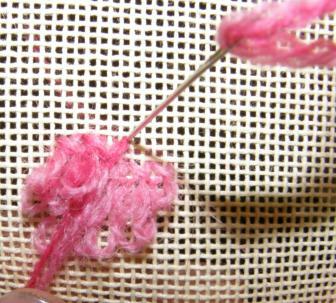 Take the needle back down at D, holding the loop under your thumb to keep it in place, to complete the velvet stitch. 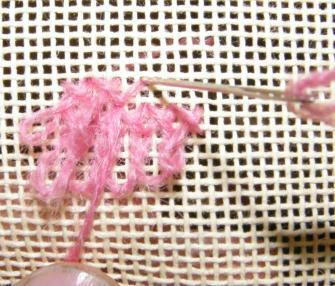 With the first stitch completed, bring the needle back up in hole C to begin the next one. Repeat the first stitch along the rest of the row. Work following rows above the first. I like to take the yarn through the back of the stitches and begin the next row at the left again. Remember to work up towards the top of your velvet stitched area. 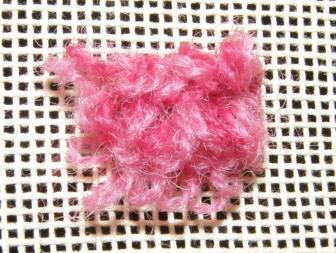 I worked the sample in the previous photos with one strand of Appleton's crewel wool for clarity, however, if you are stitching fur it can give a more realistic effect if you combine different coloured yarns in the needle. This also gives the needlepoint stitches more body. Learning how to needlepoint involves using your creativity as well as just learning the stitches. You might like to mix and match between three shades, using 1 and 2 at some point, then 2 and 3, and lastly 1 and 3. This will give you a more random mix of colours in your fur. 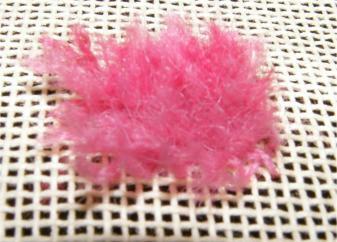 The photo above, shows my completed mini section of velvet stitch before trimming. The final step is to snip the loops to create a fuzzy pile. If some loops were slightly longer than the others you can give your fur a "hair cut" and trim it so that everything is even. 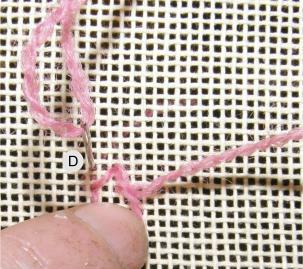 I hope this how to needlepoint guide to velvet stitch has been helpful.